I'm someone whom played the first game for a brief while but I just didn't have the time to ever spend on it, so I forgot about it. 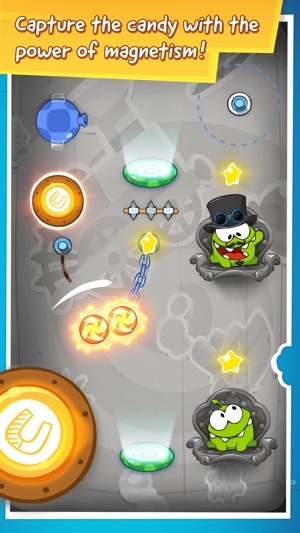 When Time Travel was free app of the day, I was reminded and downloaded it immediately. Since then I've been beyond addicted; the animation is adorable, the cartoons humorous, and the gameplay puzzles just difficult enough to keep me coming back for more. Anyways, I'll definitely be recommending this to anyone who wants a fun way to kill time. Just don't be surprised when your phone starts dying and you realize you've been playing until 6 AM. The levels in this game are honestly very fun to play and contain well-thought out puzzles. 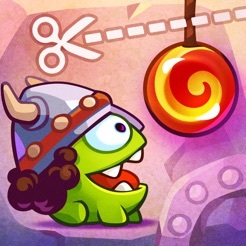 However, I didn't really get to enjoy playing through them because of one main thing: the absolutely atrocious amount of popups that told me to download "CUT THE ROPE KING OF THIEVES." Literally every time I would begin another session of playing this game I would accidentally click the popup because it appears after every 3 deaths or whatever. Want to advertise one of your other games? Fine, but put an ad for it on the title screen, but NOT AS AN ANNOYING POPUP THAT I ENCOUNTER EVERY THIRTY SECONDS. Less frequent but still annoying were other popups telling you to buy hints and stuff. It's just extremely frustrating to see a classic game from the early days of the iPhone get slowly overrun by corporate greed. Also, in World 11 (the future), I always encountered a problem where the game would start massively lagging and the only way to stop it was exiting out of the app and reopening. Please fix. Another Streaming Pile of Hot Freemium Trash. I am so glad that I was able to acquire this game for free. Had I paid for it I would be quite annoyed and angry. Though, even though it is free I still am very annoyed and disappointed. 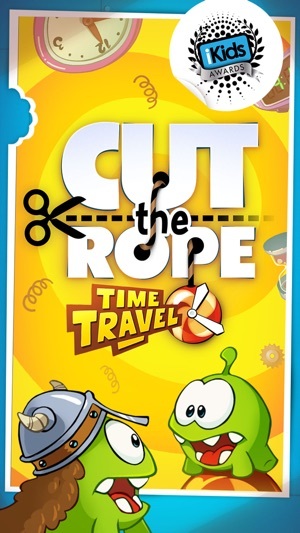 I find this newest installment of the Cut The Rope series of games to just be another tired and pathetic freemium con-job. Of course, it's a paid freemium game and that, in my opinion, makes it twice as terrible. 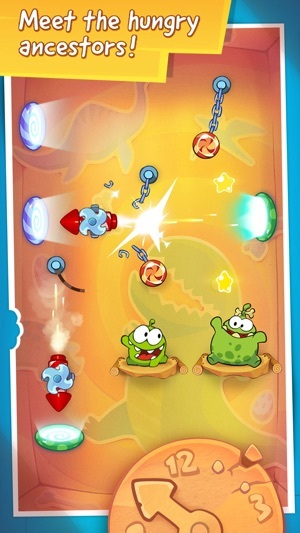 Ever since, Zeptolab, introduced in-app purchases and advertisements into this franchise I believe that is has just become utter trash. The game contains an untold number of stupid micro-transactions and truly annoying full-screen pop-up advertisements that greet you every few minutes or so. 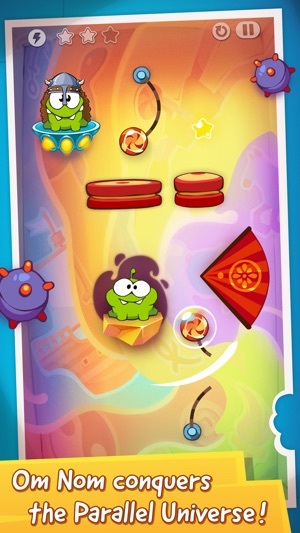 Just like Rovio and Halfbrick before them, I believe Zeptolab has devolved into another low-rent, immoral and unethical game developer and I know for sure that I won't ever support them or purchase their titles again. 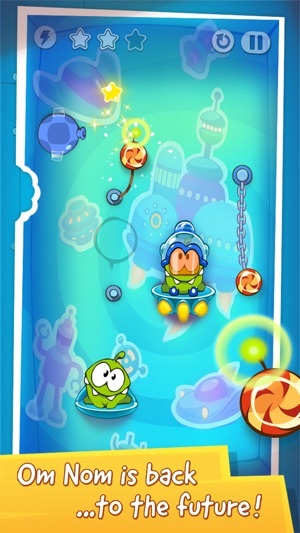 I think that this game might be enjoyable if you had never played the original, IAP-free/Ad-free game before. But, I would assume honest and longtime fans of this serious would be just as disgusted and disappointed as I am with this pathetic excuse for a new entry into the series. I don't think that you lose anything downloading while it's currently the "Free App of the Week." But, I would strongly advise that no customer purchases this IAP-laden, PAID game, once it stops being on sale for free.